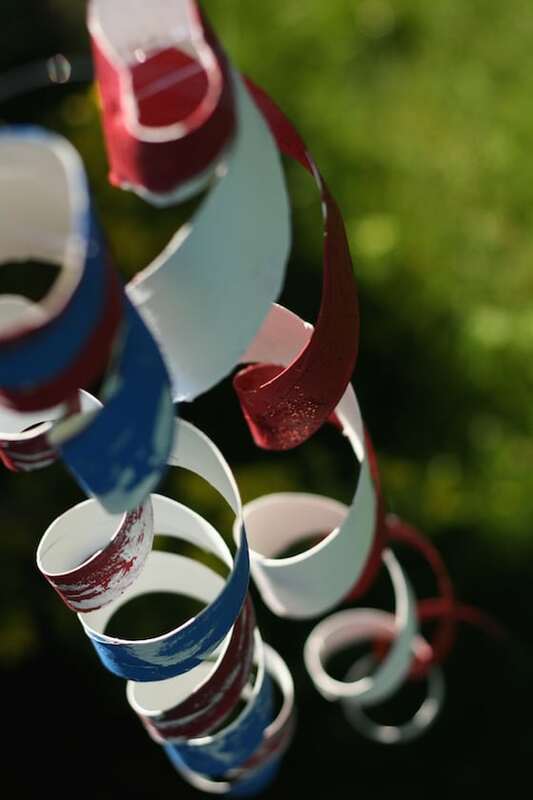 Here’s a great way to re-use your paper towel rolls: turn them into colourful, spinning outdoor ornaments! 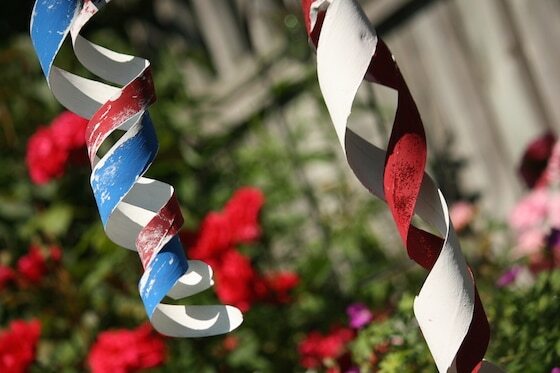 These patriotic wind twirlers are just perfect for decorating the yard for Canada Day or the 4th of July! Yes. I admit to being a little obsessed with making outdoor ornaments. That’s ok, right? Summer is short, and it’s so fun to deck out the patio and porch and yard with colourful, homemade decorations. 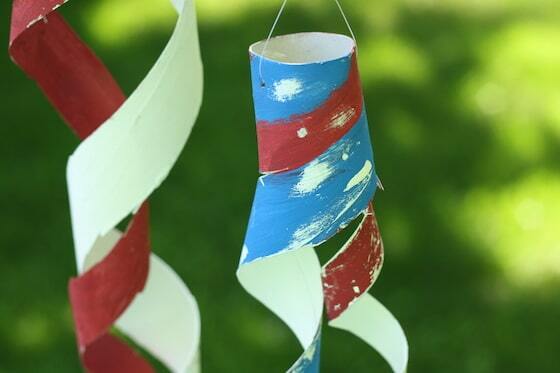 This week we’re working on Canada Day crafts, and thought these Canada Day Wind Twirlers would be great to hang in the backyard for our Canada Day celebration. 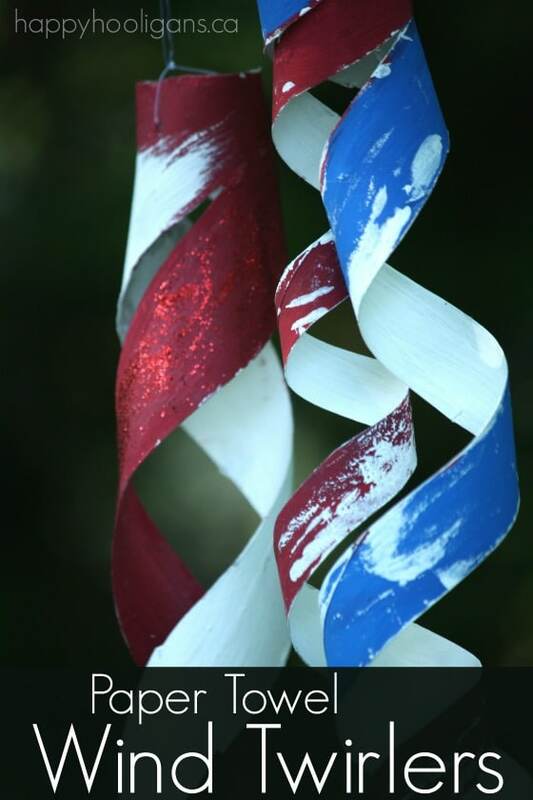 For my American friends and followers, I’ve made a red white and blue twirler because you celebrate Independence Day just a few days after we celebrate our national holiday. 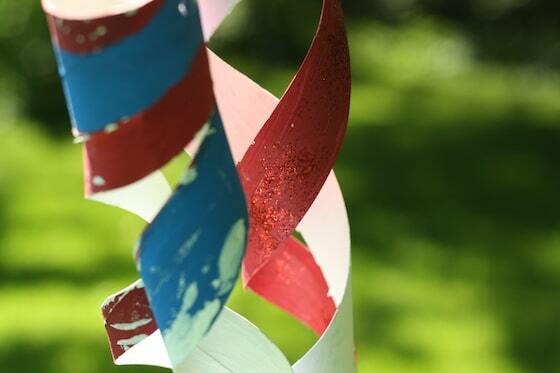 Hopefully, no matter where you live, you’ll be inspired to make some wind twirlers in your own country’s colours. 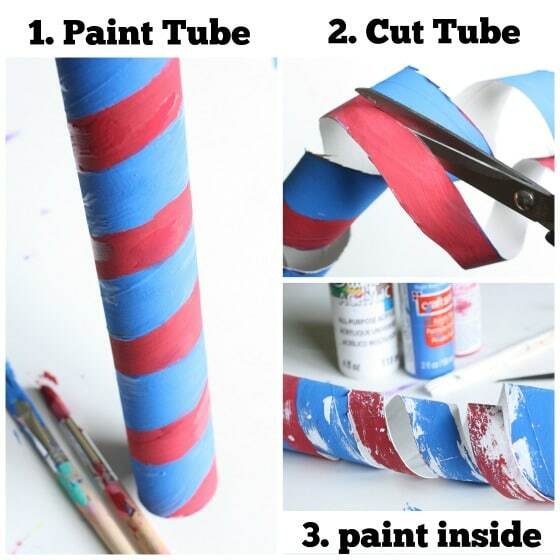 Starting at one end of the cardboard roll, paint a diagonal strip of colour around and around until you get to the top of the tube. 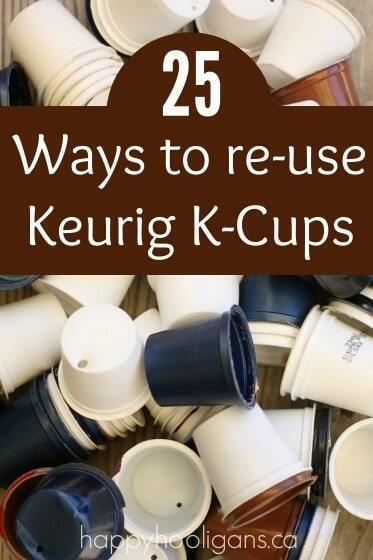 Repeat with as many colours as you’re using. When your paint has dried, cut along the lines of colour, leaving an inch or so of un-cut tube at the top. This is where you’ll thread your fishing line through to hang your ornament. 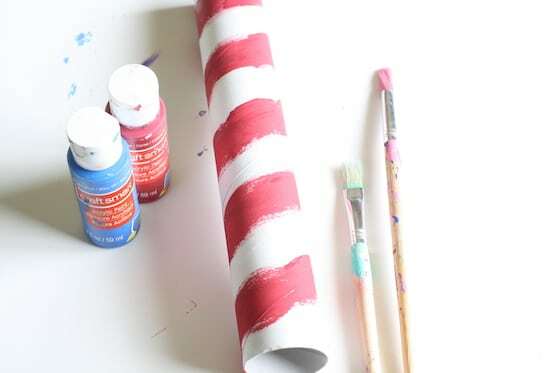 If you’d like, you can unravel your strips, and paint the inside as well. 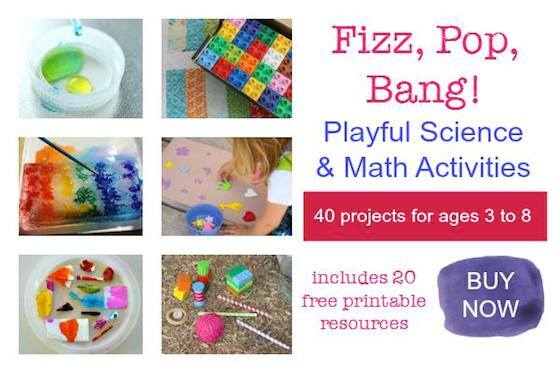 For some extra pizazz, you can go over your colours with a bit of glue, and sprinkle on some glitter. We did that with our red and white Canada Day twirler. When everything has dried, poke two holes (I used the point of a pencil) in the top, uncut portion of the tube, and thread some fishing line through. I knotted ours just above the top of the tube, and left a single, long tail of fishing line for hanging. A single line (rather than a double line) of thread or yarn will allow your tube to really twirl. 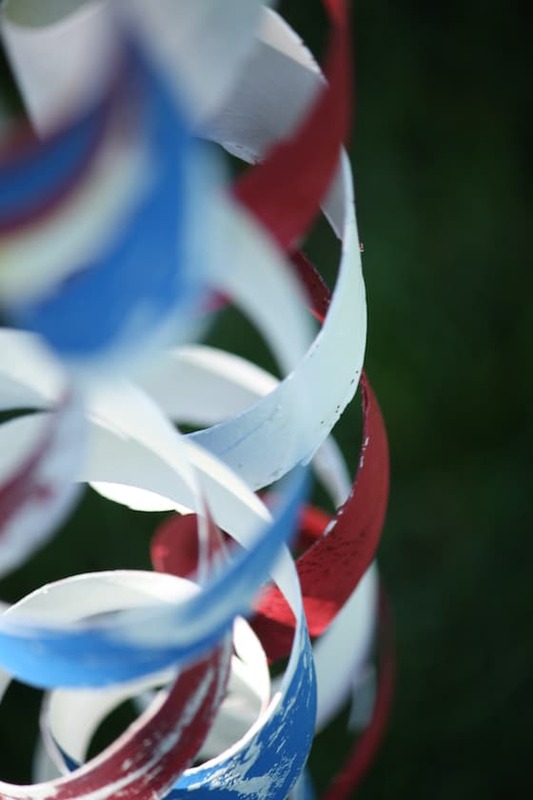 Now, hang your patriotic wind twirlers from your front porch or around your patio, or even from the branches of a tree in your yard. Happy Canada Day to my Canadian Friends, and Happy Independence Day for those of you in the U.S.! Hi Krisanne. Thanks for letting me know. Here’s what probably happened. I used to have 2 sign ups on my blog. 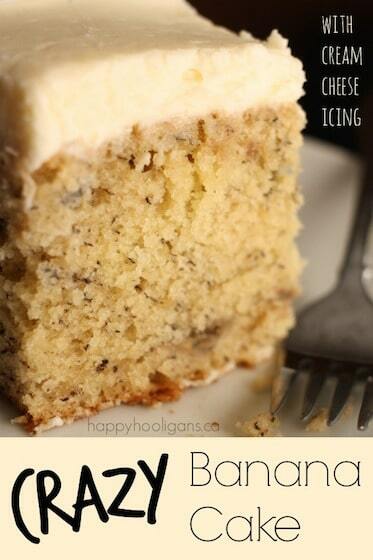 One for daily posts (or however often I publish them), and one for weekly newsletters. I rarely do the newsletter though (not enough time), so I’m guessing that’s the sign up you might have used. I now have a weekly post sign up at the top of my site. It’s a coral coloured bar. If you fill that in, you will likely start receiving my posts as I publish them. 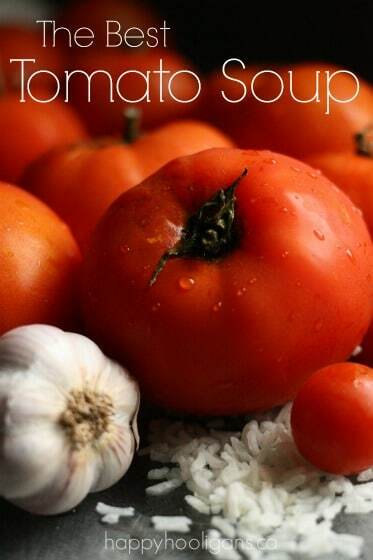 Hope that helps! Thanks so much for following along!